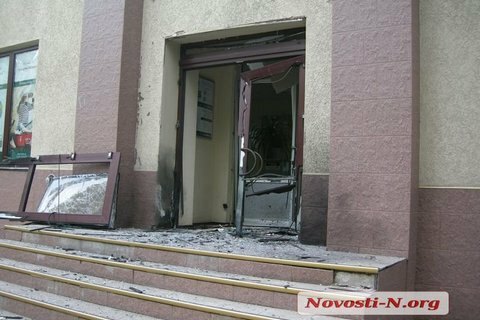 On the night of Thursday, 11 May a local office of Pivdennyy Bank in central Mykolayiv was damaged by an explosion, the local publication Criminality. Net reported. The explosion took place at about 2 in the morning. According to preliminary reports, the blast was caused by an explosive device equivalent of 200-250 g TNT. The entrance door was completely destroyed, windows were smashed and some internal structural elements were damaged. The explosion smashed windows in neighbouring houses. According to preliminary information, there were no casualties. The bank is located on the first floor of a nine-storeyed apartment building along the city's main street. Pivdennyy Bank was founded in 1993. Its first offices were opened in Odesa and Ilichevsk (currently Chornomorsk). Mykolayiv's office was opened in 2001. This is already at least the fourth attack on this bank over the past year. On 26 April 2016, the bank's office in Odesa was fired on from a grenade launcher. On 30 July 2016, a bomb exploded near the office in Zaporizhzhya. On 12 September 2016, an explosion shook one of Kherson offices of the bank.